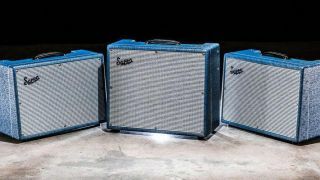 When Supro announced its return at the tail-end of 2013, its reissues of amps such as the 1648RT Saturn Reverb and 1624T Dual-Tone went down a storm - now, the company is setting its sights on the future with a trio of all-new valve combos. First up is the 1642RT Titan, a 50-watt 1x10 combo designed for gigging guitarists with big pedalboards, with a 6L6 power section, all-valve reverb, output-valve tremolo and a Supro HP10 Hemp Cone speaker. The 1642RT Jupiter 1x12 combo, meanwhile, offers vintage tones with ample headroom, thanks to switchable Class A (35W) and Class AB (45/60W) operation, with different tremolo effects from each channel, plus 6L6 power valves and a Supro HP12 Hemp Cone speaker. Finally, the 1675RT Rhythm Master 1x15 delivers the same big sound as the S6420 Thunderbolt, but adds an all-valve six-spring long pan reverb, as well as output-valve tremolo, switchable Class A/AB power amp wiring and a 15" Supro TB15 speaker, co-developed with Eminence. All three amps feature independent bass and treble controls, are assembled in New York, USA, and engineered by Bruce Zinky, Thomas Elliot and David Koltai.